"Finally! The Secret Is Out!" ...Even If You Have Little Or No Experience!" Introducing the ALL-NEW Hear & PlayTM Salsa Piano 101 Series! How to easily play tons of Salsa and Latin chord patterns that are guaranteed to make you look like you've been playing for years. Learn several Latin rhythms that you can start playing today. Like the montuno, clave, and more! How to play several Salsa bass lines on your left hand and accompany them with powerful right-hand chord patterns. How to lock in with the band and ensure that you're always playing the right rhythms at the right time (and how to listen for them). ...And much more revealed in the report and video lesson clips below! There's so much on the internet but at the same time, so little. And perhaps you've learned this, firsthand, as you've searched for real, systematic ways to spice up your piano playing --- and most likely came up short. Sure, you can find a simple tip here or a random tutorial there... but even with all the information on the net, there are very few places to get real, reliable, systematic methods to solve your musical problems. And if you do manage to find a resource, you'll be lucky if that resource isn't the typical "uppity" type, which only focuses on the sheet music side of things (...or big old fancy words and mathematical equations for sound that mean very little to you). On the other hand, maybe you've come across someone who's posted a tutorial clip on their piano in the basement. But you're frustrated because it's just "one piece" of the puzzle. And you want all the pieces... not just random pieces that you have to try to put together at the end (...in hopes that you'll eventually get all the missing links). No doubt, when you insert Salsa and Latin music into the equation (and especially some of the other genres we specialize in), the search gets even harder. Because thousands of frustrated musicians flock to our sites daily and are, quite frankly, relieved when they find us. "I never knew such a place existed"
"I didn't know that there was a place where you can actually learn by ear. I thought it was something you have to pick up on your own"
"If I would have known about this site 5 years ago, I'd be pro by now"
"Where have you guys been all my life?" Perhaps your thoughts aren't that far off from the hundreds of e-mails we get per like this. If you want to learn salsa piano by ear, you've definitely come to the right place. Not only does this course focus specifically on salsa for a whole 2 hours, but it also teaches you how to understand common patterns, rhythms, and chords without any reliance on sheet music, whatsoever. Whether you're a beginner or have some experience playing in other genres, you'll take away several techniques from the program. In fact, I've been playing for over 17 years and have never played many of the salsa & Latin rhythms that are introduced in this course by Jeff (who you'll meet in a second). Together, we've systematically designed this course so that it starts at a place where most musicians (even beginners) can understand the concepts and get to work right away --- but challenging enough to keep our experienced players occupied. Just because you've played for a while doesn't mean you'll automatically pick up Salsa piano right away. There are some unique rhythms you'll be mastering on the left hand that make it challenging to concentrate on the right hand. But once you go through our step-by-step process, by the end of the course, you'll be well on your way to mastering these rhythms and playing them with ease. So with that said, there's something for everyone in this course. playing or wanting to beef up their current skills. Anyone who's sick and tired of playing the same stuff over and over and wants to explore the world of salsa & Latin styles. Anyone trying to learn basic salsa changes, montuno patterns, and clave rhythms that can be put to use right away. Anyone wanting to learn the famous salsa sound that's found in much of today's music. (You never know when you'll need to bust out playing Salsa music. Having an extra genre under you belt will ensure that you're versatile in all situations). And lastly, anyone hungry for more! "We know you specialize in ear-training and music theory." "We know you specialize in gospel music." "As of late, you've even released two jazz courses." Eventually, we will have covered every genre. Our mission is to make "playing by ear" just as supported and accessible to useful resources as the sight reading world... and right now, the playing field is not equal. If you want to sight read, book stores are filled with resources for you. If you want to play Beethoven, there's no lack of music teachers, schools, and books waiting to teach you that. But playing gospel... or salsa... or blues... ALL by ear? Who specializes in that? "Introducing My Good Friend, Mr. Jeffrey Goodkind..."
Jeffrey Goodkind has been playing and performing for over 15 years and still recalls the day he fell in love with salsa music around 8 years ago. Having been trained classically for many years, Jeff eventually took the plunge into the ear world and found that he had a knack for playing Salsa, Latin, and Afro-Cuban styles. He's since traveled the world playing for many well-known artists and recording his own music. He is a graduate of the University of California, Los Angeles (UCLA) where he studied piano performance and music and spends his time teaching private students and traveling globally on tours. Now, what really convinced us that we absolutely NEEDED to make Jeff a member of the Hear and Play Family and teaching staff was his passion for Salsa and teaching the various concepts. We got the opportunity to check out many salsa musicians but his ability to break down the rhythms and pattern was second to none. As a company, Hear and Play Music serves over 297,400 musicians from all around the world and supplies over 1.5 million visitors with online piano lessons each and every year! Over 40,000 students rely on our paid courses to teach them cutting-edge techniques without having to pay hundreds -or- even thousands of dollars in classes and private lessons. I'm convinced that after just 2 hours with Jeff and our Hear & Play Salsa Piano 101 course, you'll be well on your way to mastering salsa styles by ear. Incorporate the fundamentals of harmony and Afro-Latin rhythms and add loads of flavor to your patterns. Two clave phrasings you must know in order to play salsa music. You'll learn both the "2-3" and "3-2" phrasings and how to integrate them with your salsa patterns. How to play a 1-4-5 progression like you've never played it before. When broken up and applied to salsa rhythms, "1-4-5" progressions are a different beast! Various "hot and spicy" major and minor salsa progressions you can start playing right away. How to inject your own flavor into these salsa rhythms and patterns and come away with a style all your own! The difference between montunos and claves and how one affects the other. How a drum pedal can help you keep and improve your timing. It is imperative that you stay on beat and locked in with the band. "No More Guessing. These Are Solid Techniques From The Pros Themselves!" How to incorporate major 7 chords into your salsa progressions. You'll love this one! It's along the line of "salsa jazz." Why the sixth and seventh degree of your major scale is so important, melodically, in various salsa chord patterns. The power of the 5th tone and how you can use it as a temporary home base to create awesome-sounding chord movements. The role of other rhythm instruments in a salsa band and how to best lock "cleanly" with other members of the band. How to know the difference between the "2-side" of the clave and the "3-side" and why knowing this can keep you sync with other members of the rhythm section. Over 12 different salsa patterns that you can play, one after the other! You can literally put on your own salsa concert in your living room after learning these patterns (no joke)! How to master the off-beat bass. Warning: It can be challenging at first but you'll learn many strategies to make sure you're playing your bass lines correctly. How to break up chords to get the traditional salsa & Latin sound everyone's used to hearing! Just this alone will have you playing Salsa rhythms right away! "Don't Settle For 'Good Enough.' Learn The Strategies to Becoming a Great Salsa Musician..."
How to incorporate minor and diminished chords into your montuno patterns. This definitely spices things up, trust me. The secret to operating in the harmonic minor scale and how to borrow chords from that scale to play more interesting movements. How to easily transpose what you know in one key to another in just 2 easy steps. The key to creating beautiful melodic movements over various Latin chord progressions. How to clap and master the montuno pattern even before you sit down at the piano. Half of the battle is won when you're away from the piano. Obtain a concrete understanding of key auxiliaries of the salsa rhythm section: Conga, Bongo + Bell, Timbales, and Bass! And your role as the piano player. Easily integrate four professional Latin chords used by the most popular salsa bands around! Strengthen your left hand with 5 simple, yet effective bass walks that'll add tons of flavor to literally any salsa track! Learn how to apply both the "forward clave" and the "reverse clave" to your chord progressions. Knowing the difference is crucial to your salsa playing. Learn what the "pulse" is and how to adapt to it. This is probably one of the most important concepts you'll learn. Learn the secrets of syncopation and how it applies to your Latin playing. Combine the clave and the montuno pattern simultaneously and watch heads turn as the energy explodes! The rules on how to experiment with your own left-hand bass lines. Now you'll learn how to lay them underneath the basic montuno pattern, on demand! Spice up your Latin playing by sliding in several passing tones you can apply to virtually every chord you play. The time is finally here! Learning to play salsa and being able to play an entirely different style of music has never been easier. No more having to struggle to learn it on your own. No more paying endless amounts of money for a private instructor just to tell you "you'll get there soon." 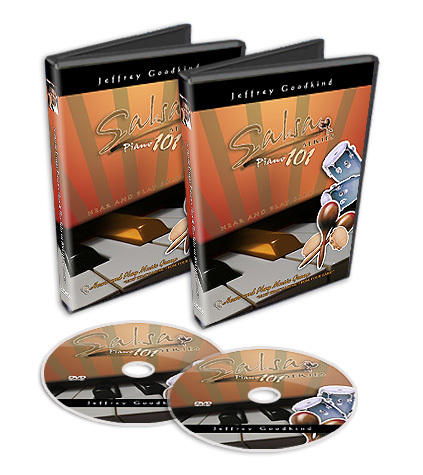 Now, all you have to do is slip a DVD into your computer, laptop, or personal DVD player and learn literally everything you need to know to get started playing salsa piano. Now listen, you don't have to go to salsa and Latin concerts and clubs anymore saying "I wish I could do that." If you truly want to start playing salsa by ear right away, look no further. In this 2-hour, 2-disc set of step-by-step instruction, you'll be taken by the hand and shown, step-by-step, how to master TONS of rhythmical patterns, chords, claves, harmonizations, tricks, and techniques, as well as the underlying concepts behind them. "Basics & Fundamentals to Playing Salsa Piano By Ear"
Hear and Play Salsa Piano 101: "Basics & Fundamentals of Playing Salsa Piano by Ear "
...They take you step by step all the way until you've achieved all you've ever wanted." My name is John Webb from Columbus, Georgia and I'd like to give a brief testimonial. I came to Hear and Play's website about 5 months ago and boy I must really say, I was very leery about purchasing the instructional videos. However, after hearing the clips, no further persuasion was needed. I have ordered a few DVDs and they (thank God), have taken my playing to a higher level. Mr. Griggs and staff, I'm sure you know what it feels like to be asked to play for different occasions -----to be able to follow other great players, with which you may not know all of chords being played, but you can hear them, and can play most of them so you don't sound different -- friends this is a great feeling. To be flown overseas, and around the world (Grand Cayman, Jackson, MS, Jamaica etc.) for your playing, I really can't explain the feeling. In conclusion, all I can say is this: I've only known Hear and Play for a little over 5(+) months, and if it has changed me thus far, I'm waiting to see what other enhancements may be made in the near future. One other thing, if I may add. Have you ever seen a great player 1-on-1 and you go to them and admire them and their touch? One thing, for the most part, that I have seen that they all have in common, is that they never want to give out any tips. They smile, shake your hand and then get up from the piano/organ and walk away. Know what I mean????? With Hear and Play, I've found the right attitude. They take you step by step all the way until you've achieved all you've ever wanted. Thanks a billion Mr. Griggs and staff and God Bless you all. ...now I don't even struggle to play what I hear on the radio anymore!" I got to know about hear and play late April. Before then, I used to spend hours a day trying to play what I hear on the radio. But it was all to no avail. When I signed up for online lessons at Hear and Play, I took those lessons seriously because I didn't have a music teacher. HearandPlay.com taught me everything I needed to know in a simplified manner. Jermaine taught me like I was his own daughter. Now I don't even struggle to play what I hear on the radio anymore. I now play keyboard with professionals in my area. I am really grateful to Jermaine Griggs. God used him to completely transform my music career. I really don't know how to repay you back. ...I saw a HUGE difference in my playing within 15 minutes. Literally!!!!" You Broke My Chains!!!!!! I just want to thank you so much for the influence you have had in my playing in a matter of hours!!!! You broke the chains off my hands and my mind. It has been difficult to learn songs in every key because many musicians look at it as such an easy thing to do that they don't have the patience to (or don't want to) teach you the basics. After watching the course one time through without playing, and then going back and learning, I saw a HUGE difference on my playing within 15 minutes. Literally!!! I am now playing cleaner bass lines and full-sounding chords! I have already learned two keys in one day and I am going to keep that pace as it is suggested in the course. I thank God for you and I am proud to be a student of the Hear and Play Institute. GOD BLESS YOU!!! ...I also have the 300-page workbook and that took me to another level as well!" Before I heard of Jermaine Griggs or Hear and Play, I would just kind of sit at the piano and bang on the white keys! lol. But seriously, this site and all of its resources have TREMENDOUSLY improved my playing ability. I also have the 300 page workbook and that took me to another level as well. I guess what I'm really trying to say is thank you for all of this! I tell as many people about this that I can (free advertising!). ...There are things I've learned here that even classically-trained pianists who've been playing for 12 years don't know about. This site is easily the best resource around for pianists. I mean, not just for gospel pianists, but anyone can learn it. There are so many tips and tricks I've learned on here that even classically trained pianists who've been playing for 12 years don't know about. And when I tell them these things, they just can't believe some of the simple but great techniques that are out there! I think the theory behind playing by ear is so diverse, and simple to understand, it makes playing the keys just so great and enjoyable! Thank you Jermaine & Jonathan, and everyone at the company who share their advice and experiences! I know a lot of pianists who like to keep things to themselves! But the guys here want to share and help out anyone who needs it. Because of Hear and Play, people can't believe I've been only playing for 6 months. I had someone say to me a couple months back - when it had only been 4 months since I'd even touched the keys of a piano, that I'm pretty good for someone who's been playing only a short while! It's truly amazing. I've even taught my piano tutor some tips and tricks along the way. Keep staying blessed! This site is THE BEST... PERIOD! ...I thought what I knew was the limit... but I was wrong!" Hi, my name is Miguel A. Martinez. I started playing the keyboard when I was sixteen years old. Time had passed and I was not getting any better. The teacher that I had did not teach many chords or progressions. I really wanted to learn everything that there was to learn on the keyboard so I decided to go online and order whatever they had to offer for keyboard learners. While I was searching for different sites to see which one was good, the HearandPlay website soon appeared. I started to look at it and read the information that it provided about how to learn to play keyboard by ear. That was what made me go into it even more. It gave helpful video samples on what I would get after ordering the DVDs. Jermaine Griggs is good at playing the keyboard and I was really impressed with how much Jermaine Griggs knew about the many chords and progressions. I thought that what I knew was the limit of the variety of chords out there on the keyboard, but I was wrong because there are a lot. Since I first I got it, I'm still learning many things. As of right now, I know the scales and chords. Now I'm studying the different progressions. The virtual chord finder is great too. I really like it and use it every time I forget a certain chord. I still have lots to learn but I know that one day I will be really good and any song that I hear, I will be able to play it. Thank You Jermaine Griggs!!! Especially, being a world renowned drummer it helps so I can help write keyboard parts or whatever. A lot of y'all have probably seen me on the Word Network. I've been on shows like the Charles Shelton Jr. show on the Word Network, Dr. Bobby Jones Show, Pax Network, Sky Angel, as well as touring and doing clinics in many different cities. I also have an instructional Gospel Drumming Dvd that I have for sale for all ages. If you're truly serious about taking your salsa piano and keyboard playing to new heights (...learning salsa progressions, incorporating montuno and clave rhythms, mastering bass lines, etc. ), then you'll definitely want to be one of the first 79 musicians to take me up on this incredible offer. Not only am I dropping the price of this dvd course a considerable amount, but if you order today, I'm also throwing in a few "early bird" items (as you'll read below). HP Salsa Disc 1: Part 1 will uncover the basic rhythms and fundamentals you need to get started the right way. You'll learn the secrets to playing the classic montuno pattern with several different chord arrangements to choose from. He then takes you by the hand and breaks down professional Latin bass lines and the essential clave rhythms you must know in order to play in a salsa band! HP Salsa Disc 2: Part two will show you how to create powerful harmonic movements with major, minor, seventh chords, and more! That's not all, he's even going to unveil chromatic walk-downs as well as tons of sizzling major and minor chord progressions, passing chords, and fill-ins that you can use in your Salsa playing right away! ...And for the next 79 musicians only. I truly believe that you must be a student of the music and the best way to do this is to listen to great musicians and performers who have come before you. This "Best of the Best" collection we've personally assembled has exclusive clips of the best salsa and Latin performers to ever walk the earth and you'll be able to listen to what they're doing and closely study their approaches. You'll find many similarities in what you're learning and the styles of these great performers! Limited to next 79 orders. 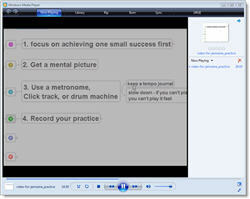 "7 Tips For Effective Practice" 20-minute Online Video By Khaliq Glover ($21.95 Value). My good friend Khaliq Glover, who is a grammy-award winner audio engineer, took time out of his busy schedule to record a bonus 20-minute online video on "7 Tips for Effective Practice" and he wanted me to pass it on to our serious salsa players. Not only is Khaliq a self-taught guitarist, but having had many opportunities to work as an audio engineer with entertainers like Herbie Hancock, Michael Jackson, Lionel Richie, Prince, and others, he's heard and seen the way they practice their crafts --- and he's sharing it with you in this 20-minute exclusive online video. (Compliments of Khaliq-O-Vision.com; Limited to next 79 orders). "Early Bird" Super Bonus #3 HOT!!! HOT!!! HOT!!! This course sells for $20.00 at HearandPlay702.com but because you're ordering today, I'm throwing it in absolutely free as a FAST-ACTION BONUS. *Please note: This is a digital download only. It will not be physically shipped with your Salsa Piano 101 dvd course. You'll receive an e-mail and will be able to download all 2 hours of the program directly on to your computer. "Are you ready to go to the next level?" Even though, for all this, I could very well charge over $130.00 and still get tons of orders for the 2 hours of step-by-step training --- plus the bonus 2-hour downloadable course and extra online bonuses you're getting. Not to mention the additional 3 Monthly Music MentorTM courses valued at $79.95. So you're not only getting 2+ hours of step-by-step dvd footage on salsa and Latin styles but an additional 4.5 hours of audio training in free bonuses, 2 hours in downloadable material, and some other goodies I've thrown in above. Then there's the ongoing support --- what else could you possibly ask for? With the bonuses valued at over $121.90+ alone and the DVD instruction valued at $60 (based on on the industry average of $30 per 1-hour dvd), I could actually offer this package as high as $180.00... even more. In fact, many piano websites sell courses in that price range that aren't as long as 2 hours and not packed with as much information as ours. For just 2 easy monthly payments of $26, this entire 2-hour Hear and Play Salsa Piano 101 package plus the extravagant bonus package can be yours today. This offer is subject to change at any time so if you're really interested in this dvd course, I suggest you act quickly --- otherwise, you might end up paying well over $130.00 or possibly the full $180.00 in the future). Even worse, you may be too late and not able to take advantage of the this entire offer at all (we're only accepting the next 79 customers for the bonuses listed above). The next price change will increase this package to 2 payments of $35. After that, the price will most likely remain at 2 payments of $39 like many of our other courses. Even though the price is already a complete steal (about the cost of a dinner for two at the local buffet restaurant), here's what's really important. If this Salsa Piano series was just another course that sat in your bookshelf and didn't teach you anything new, it wouldn't matter what the price was. IT WOULDN'T BE WORTH ONE PENNY. Are you looking to jump-start your salsa piano playing or wanting to beef up your skills? Are you sick and tired of playing the same stuff over and over and want to explore the world of salsa? Are you interested in discovering new Latin changes, patterns, and various chords and rhythms that can be put to use right away? REMEMBER: The next 79 to order will be guaranteed to receive the online bonuses. So not only do you get the flexible payment plan, but you have a full year to decide whether this course is for you. At 2 monthly payments of $26, you are losing absolutely nothing and the risk is all on me. What else can I say? Your package is shipped via USPS Priority Mail. You will receive the Hear and Play Salsa Piano 101 Series in a week or so (depending on the shipping options available) and you can get started learning new chords, voicings, and salsa patterns the same day you receive it. You can literally be on your way to playing salsa piano by ear (or improving your current salsa skills) in a couple of weeks!